Can't believe it's Christmas already. I have been really busy studying this year, and I am proud to say that I passed my Beauty Specialist ITEC and CIBTAC exams with Merit. Last week I also did an intermediate course with Zoe Clark, one of the best Makeup Artist in Ireland. I can highly recommend this course to any aspiring makeup artist. In the course, there was also a photo shoot included with the amazing photographer Barry McCall, so if you are interested what the shot looks like, then visit my Facebook page. Being a full time office worker and part time blogger, it didn't leave me much time for my friends and family this year. This is all about to change next year. Hopefully. Many thanks to all my followers, for all your visits and comments. I wish you all Merry Christmas and I hope you all will have a great time with your loved ones. Anyways, enough of sentimentality, this is my make up Look for the Christmas Day and I hope you like it. Blend the BB Shimmer eye shadow in Rose Gold together with the BB Shimmer eye shadow in Cognac. Apply the same eye shadow to the lower lash line with a pencil brush and blend thoroughly. MAC Mineralize skinfinish in medium deep – used as bronzer here – apply to the temples, on the cheekbones and just right under the jaw line in a figure of 3. Bobbi Brown Blush in Coral – apply on the apples of the cheeks with a blush brush in sweeping motion aiming towards the temples. What's your Christmas Day makeup look going to be? Please post your links of the look below in the comments and I will make sure to check them out! Thank you for commenting and following! Followed you right back! 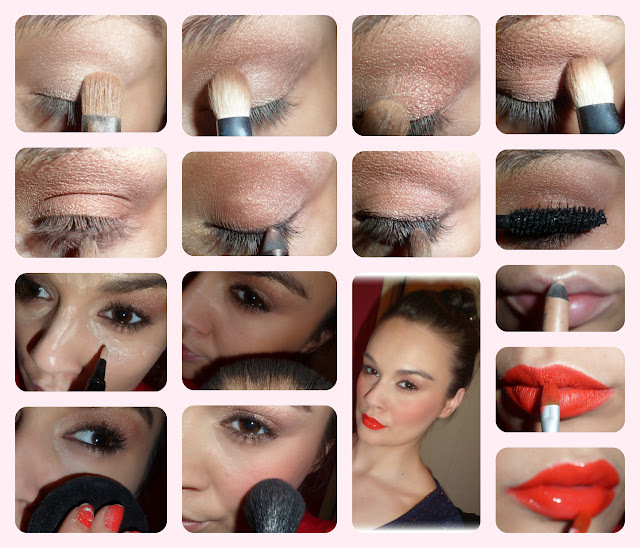 What a stunning christmas look, I hope you'll be posting a look up for NYE :) looking forward!